Your work enlightened me on what I needed to do to regain my health after suffering with chronic migraine and major digestive issues. Your work has made all the difference; a year ago I was in tremendous pain; now I am free. We are so thankful for Dr Amy, the countless hours and research she puts in to find all the pieces of the puzzle. As we continue to move forward with Dr Amy’s program our son continues to blossom into an amazing young man. I tried 3 mos of another company’s methylation vitamins with little improvement. Your Roadmap supplements have given me my life back. My rheumatologist asked to keep your Roadmap because he had never seen anyone’s joints become more stable like mine have since taking your supplements. I am over fifty and shortly after going on your Roadmap my reading vision started improving. My eye doctor scoffed when I said my eyesight was better from my vitamins. Well, her jaw dropped when she tested me and she too asked to keep your Roadmap. She’d never seen anyone’s reading eyesight improve like mine! I don’t even use readers anymore. Thank you, Dr Amy. Bless you, Dr Amy. My daughter said, “It is good to have our Mom back.” Thank you for saving my life. Optimizing methylation saved my life! 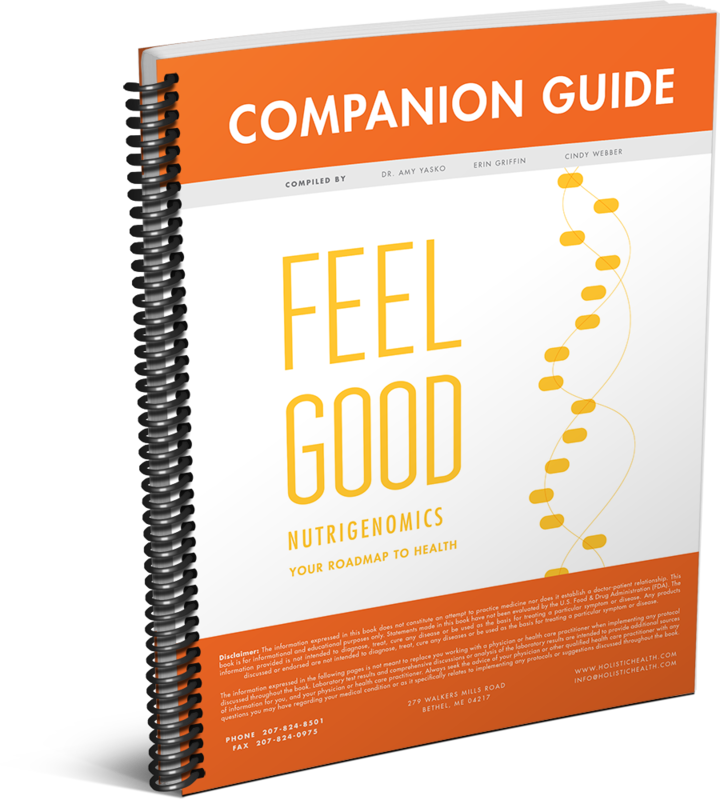 This book, Roadmap to Health, is for anyone who cares about their health. Methyl groups regulate genetic function and are crucial to life itself. With the information provided in this book, you can solve the most complex health problems and unlock anti-aging potential. This book captures Dr. Amy’s experience and knowledge about methylation, incorporating her most recent findings. Roadmap is a must read! As I look back over the years its truly amazing how much progress has been made and it really is a pleasure to have watched a sick little boy be transformed into a happy and healthy young man! With heart felt gratitude for all the time and expertise you devote to crafting a program that makes such a huge difference in so many lives. I almost died and suffered tremendously for 5 months before discovering that I have very significant methlyation mutations. No one in the mainstream medical field was able to help me. I had been to 7 emergency rooms and probably about 15 doctors (many “ologists”) before discovering your protocol. As soon as I began the ammonia program I noticed a massive shift in a positive direction happening in my body. I finally knew in my heart that I was on the right track and there was finally hope that my suffering would end!! I improved so dramatically and quickly, within the first couple of weeks of starting your protocol, that I was truly shocked and amazed beyond belief. I just wanted to thank you for your research from the bottom of my heart and to thank you for your program because I truly do believe that it is saving my life!! Words cannot express my gratitude! You can use my email and my story however you’d like! I hope to share it with as many people as possible because I want to reach others with similar issues so that maybe it can help them too!!! Having experienced how powerful treating methylation mutations can be, first hand and in such a dramatic way, I’m very passionate about helping to spread the word. Thank you so much again!! Dr. Amy Yasko is the hope, the small flickering light, and the quiet in all this chaos of mainstream thoughts on autism…I as a mother of a very special girl am blessed to have crossed paths on the internet and through groups to happen across her breakthrough work…and make other choices for our treatment protocol. ..the lights are on and I’m always home now! Thank you for loving all our children! Dear Dr. Amy, All our thanks goes to you, your family, staff and of course cyber mums! Your tireless work and encouragement is moving us forward and gives us and our brave children a chance to enjoy life and be truly thankful for every single moment we share together, for every new word we hear, for every new achievement that would not be possible without you! We love you Dr.Amy! Federico clinically completely recovered from the autism, we are so grateful to Dr. Amy and her team that they saved Federico’s life. Never say Never to MY boy! This from my boy, the one they told me would probably never talk again, never walk properly again and never be able to hold a pen. Eight years later, I wish those doctors were here to listen to him and to read his stories and to watch him run. After being on the protocol for 8 weeks, I had my first glimpses of hope that it could work, as Andrew’s seizures slowly started to go away. Then over the next 4 years, little by little, piece by piece, gain by gain Andrew started to come back to me. At 2 years on the program his sensory issues started to get better. At 2 ½ years on the program his expressive and receptive language tested age appropriate and that was truly a milestone. At 3 years on the program, his motor skills greatly improved and he slowly started to become more social again. And at 3 ½ years on the program his articulation tested age appropriate. When he started school for the first time (I had made the decision to keep him out of school for 2 years to focus solely on the protocol) it was at a “normal” school where he did not have any kind of special help. I never told the school of his prior diagnosis and no one ever guessed. Today at 6 ½ years on the protocol Andrew still has a few remaining symptoms like some behavioral issues, inattention and some vestibular problems, but I have great hope the remaining things will go away in time as we continue on. However, with the issues he has remaining, no one would ever guess that 6 ½ years earlier he had been autistic. He is now in 2nd grade – 21 months into our journey and your program. Attached are pictures from his last field trip. He was relaxed and happy, able to enjoy the day. He is no longer overly stressed and anxious just trying to navigate his world. Last year I had to go on his field trip as support, this year I was able to just go and enjoy him hanging out with his friends. He is reading and comprehending! He is becoming a self-confident learner and person. I had two separate conferences and BOTH teachers independently said the exact same thing “Completely different child from last year, relaxed, happy, gets along with everyone, the ideal student.” Yes, that is the same child that punched a teacher this time last year. I just kept pinching myself to make sure it isn’t a dream. We have seen these improvements in all aspects of his life. In kindergarten, we coached his soccer team and after the season, concluded that team sports were just too difficult for him. Well, this fall he really wanted to play basketball so we decided to give it a try. He walked into a brand new, very noisy and chaotic gym filled with coaches and teammates he had never met and he stunned us all. He was able to process most of what the coach was telling him, wasn’t overly stressed and anxious and most importantly made new friends and “fit in.” Can you imagine? He fit in! We could not have possibly dreamed of this day. Oh and on another note – his immune system is starting to function (occasional runny nose, cough and even a recent fever). We are probably only at mile marker 2 of the marathon, but the sheer joy we experience every day, there’s no place we’d rather be. The tears have not stopped for us, they started as heartbreaking tears of pure fear and uncertainty of what the future would hold for our son. Trying to take one day at a time and figure out how to be patient with this child and at the same time searching out medical answers. Those tears have turned to tears of sheer joy. The things we will never take for granted. The play date that doesn’t have to end promptly at 1 hour while I’m hovering the whole time. The exhausted but happy smile when he gets in the car after school. When he tells ME something’s not a big deal. When he brings home a treat for his brothers from school because he can’t eat it and is so happy that they can enjoy it and gets the joy from that. But more than anything it’s his simple genuine smile. A free and happy smile. Knowing that his future is bright and he is so much stronger because if this journey. He wants to understand every supplement and how it helps his body and brain. And NEVER complains about taking them. And everyone in our family is so much stronger and healthier. I’m so happy we have started the process to health but I see so many children and families struggling every single day. I chose not to think about where we’d be without you. Know you have given us the best and only gift that matters, our child and health.